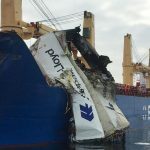 On March 27, the 178 meter long, 24700 dwt container ship Delphis Gdansk collided with the 190 meter long, 37506 dwt cargo vessel BBC Neptune off Kalundborg, Denmark. The Delphis Gdansk was en route to Russia from the Netherlands when it approached the bulk carrier Western Boheme and cargo vessel BBC Neptune. The Delphis Gdansk altered its course so that the container ship would pass to the port side of the Western Boheme while the BBC Neptune also changed course to port. 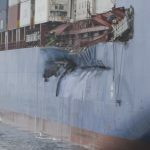 While the Delphis Gdansk passed safely by the Western Boheme, the container ship was struck amidship by the BBC Neptune’s starboard hull near the bow. 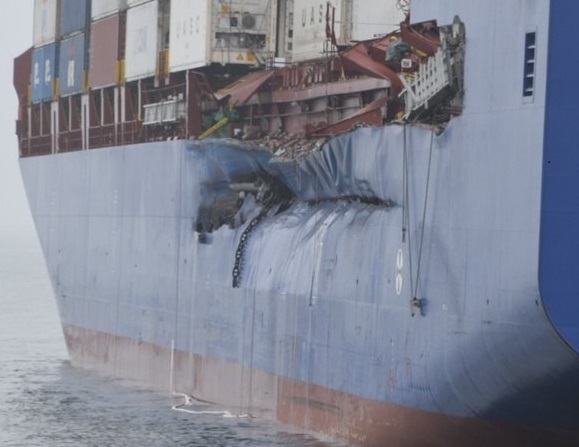 Both vessels sustained significant damage with hull breaches above the waterline. 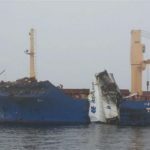 The Delphis Gdansk had several containers lost or destroyed during the collision. After the collision, a fire started on the BBC Neptune. A response boat was dispatched with fire fighters and were able to assist in extinguishing the blaze. No reports of injuries on either vessel. 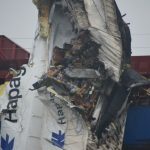 Authorities dispatched additional response vessels and aircraft to the scene while salvors began a search of containers in the shipping channel. 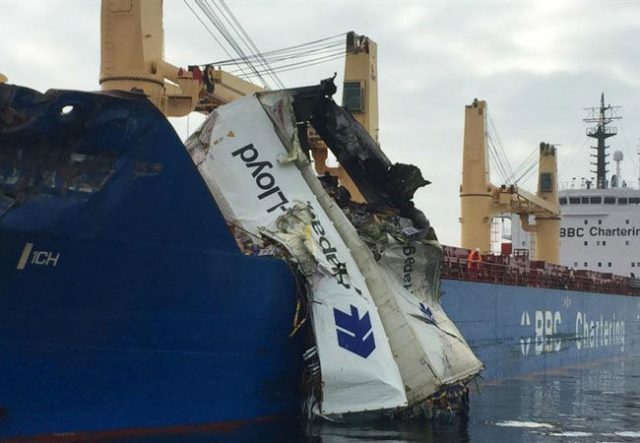 Reports stated seven containers had been lost in the collision. 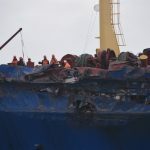 By the next day, salvors had recovered three containers floating in the channel. Reports state both the Delphis Gdansk and BBC Neptune will be taken to a nearby shipyard for repairs. Authorities have launched an investigation into the incident. 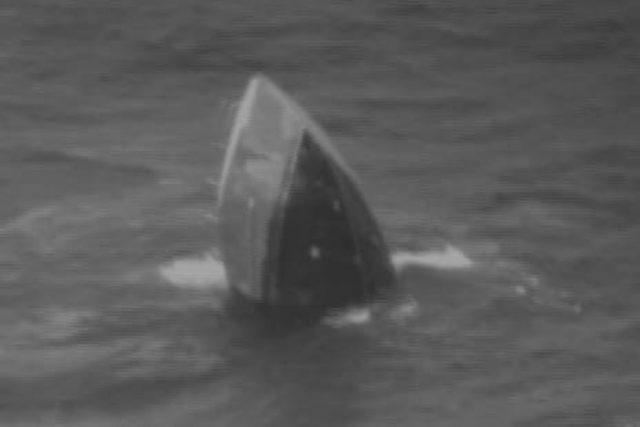 On March 25, the 61 foot long fishing vessel Princess Hawaii sank 400 miles north of the coast of Hawaii. 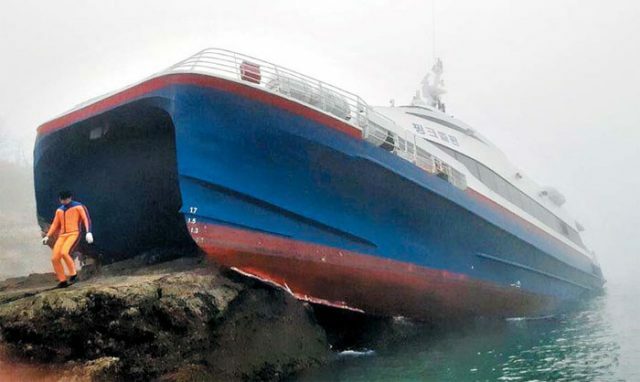 The longliner was fishing when it was struck by a rogue wave. The wave swamped the Princess Hawaii and knocking several crew overboard into the water. 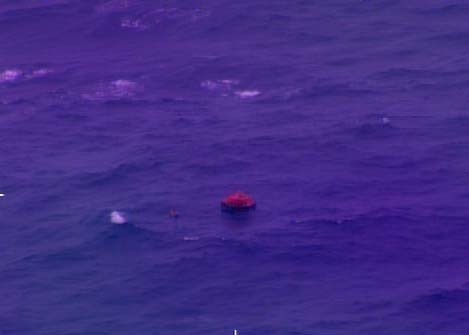 The crew launched the vessel’s life raft and sent out a distress call. The Coast Guard along with nearby fishing vessels responded to the scene. The fishing vessel Commander arrived on scene 12 hours later and pulled all 8 crew to safety. No reports of injuries. The Commander was reported to be headed for Honolulu and arrive in a few days. Reports state there was an observer from the National Oceanic and Atmospheric Administration on board the Princess Hawaii at the time of the sinking. The Coast Guard has launched an investigation into the incident. 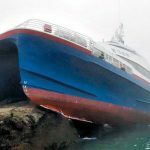 On March 25, the 34 meter long, 223 gt high speed catamaran passenger ferry Pink Dolphin ran aground off the coast of Sinan, South Korea. The ferry was en route to Mokpo from Hongdo Island with 163 passengers and crew. 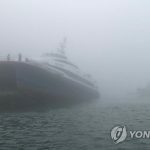 The Pink Dolphin was proceeding in dense fog when it ran up on the rocks near Heuksan Island. 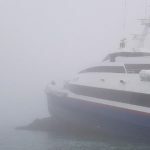 Six people sustained minor injuries during the grounding. 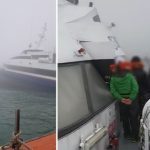 The Korean Coast Guard arrived on scene and took the injured off the ferry to Heuksan Island for treatment. The remaining crew and passengers waited for more than an hour before a rescue boat arrived. All passengers were transferred off the Pink Dolphin. Reports state the Pink Dolphin may have run aground to avoid colliding with a fishing vessel. Authorities have launched an investigation into the incident.